A-one+ is the leading service provider for the Highways Agency, supporting it to help customers with their journeys on England’s strategic road network. The company was tasked with working closely with Highways Agency (now Highways England) to undertake a refurbishment project on the northbound A1 western bypass between Newcastle and Gateshead. During this refurbishment project, it required an innovative traffic management solution that would help to safely manage the traffic and warn motorists of the ongoing work and so approached the leading temporary Intelligent Transport System (ITS) solution provider MVIS. For the project, MVIS deployed 10 VMS-C variable message signs which communicated highly visible speed roundels and pictograms to motorists. 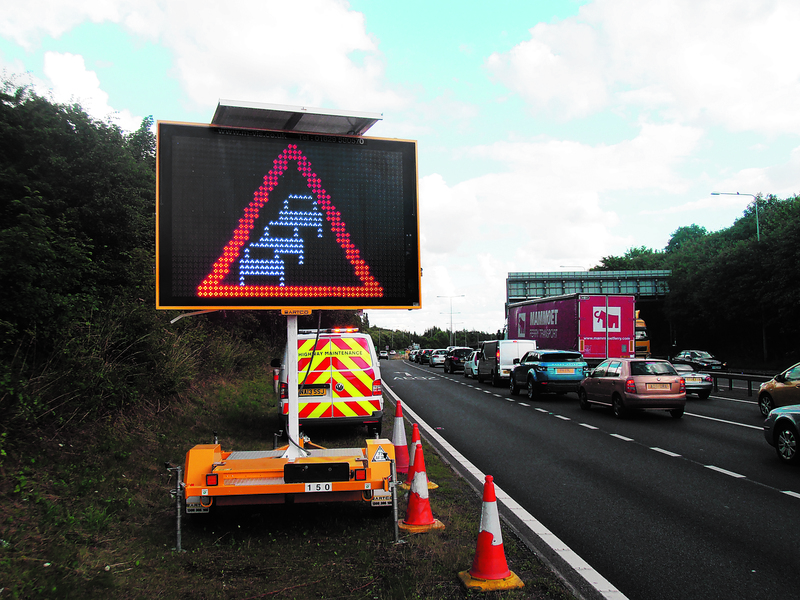 MVIS’ VMS-C variable message signs featured a display that switched from speed roundels to three colour Chapter 8/MS4 style pictograms in the event of standing traffic due to lane closures. Therefore, MVIS’ conspicuous VMS were quickly spotted and their variable messages rapidly interpreted by motorists. The result was that zero standing-traffic related incidents were recorded during the project. “Not only did MVIS’ VMS facilitate a rapid message change in response to the quickly changing traffic situation, but the high visibility of the three colour pictograms engendered an instant motorist reaction, promoting the safety of road workers, police and motorists alike. A-one+ credits the highly visible pictograms with ensuring zero standing-traffic related incidents during the VMS’ six-week installation, as when the company undertook an identical project on the southbound carriageway in 2009 using fixed frame signs, there were several such incidents.